Expansion of a sentence or a short passage is the exact opposite of precise-writing. In precise-writing one has to compress, and in paragraph-writing or in expansion of a sentence or passage one has to expand. A sentence or a passage has to be enlarged into a paragraph by a fuller and more elaborate expansion of its meaning. It can also be enlarged by adding illustrations, examples or details to a simple statement. This is just writing a miniature essay on the subject of the original sentence or a passage. No hard and fast rules can be laid down regarding the length of the paragraph. It must neither be too short, as it will be hardly be an expression of the theme nor so long, so as to become an essay. Students are generally asked to write a paragraph of about 50 to 150 words (say, ten lines). What are the steps in writing a good paragraph? Read the sentence or a passage very carefully. Try to understanding its meaning thoroughly. Having grasped the meaning of sentence or passage, proceed to expand it by adding details, illustrations, examples and proofs etc. until it is a short essay, only long enough to make a paragraph. Try to end the paragraph with a sentence, which should the summarise the whole conclusion. See that your paragraph reads like a connected piece of composition. You can write paragraph on any topic of your interest, it can be of any sentences, or common proverbs and more. Here we have listed paragraph writing topics like How to prepare a cup of tea? How to polish a pair of shoes? How to keep healthy? How to get ready for school? An Elephant, The Donkey, The indoor games I like best, The flower I like best, An aeroplane, As you sow, so shall you reap, Caught in shower, A stitch in time saves nine, Look before you leap, A rolling stones gather no moss and many more. Here I explain some paragraph topic which I listed above. With the help of these paragraph writing examples, you too can write. Make sure you don’t quit the writing the middle, it requires a continuous efforts do it until it comes naturally to you, gradually your writing skill improved. Let us see the following short paragraph with examples. 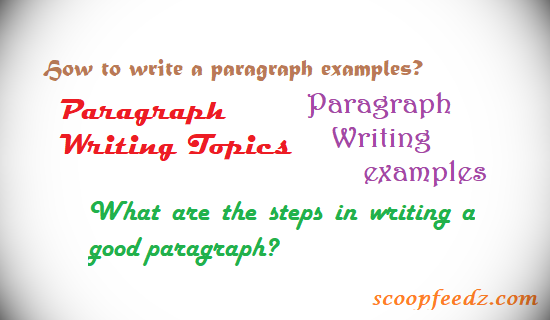 Here the some examples of writing good paragraph, you can choose any topic or sentence you would like explore. Following examples illustrate the meaning clearly and conclusion to the end of paragraph , that will definitely help in some or other. One who is temperate in eating, drinking and sleeping and in everything else and takes regular exercise needs take no medicine. Neat and hygienic food must be taken at fixed hours and chewed well. Overeating must be regarded as sin. Getting up early, taking morning walk, having daily bath, massaging the body with oil, breathing a fresh air and living in airy and sunny houses help us to keep fit. Bad hobbits of smoking and drinking etc. must be avoided at all cost. In fact ‘Health is Wealth’. One may say that it is more precise than wealth. One can secure the services of great and reputed doctors, but cannot buy health. How to get ready for school? To get ready for school, a regular routine should be followed. After clearing your bowels, brush your teeth, and have a bath. Say your prayers to God and put on neat and clean school uniform. Put all your text books and exercise books required at school in your school bag. Be sure before leaving for school, that you have done your home task and lesson very well. Also see that your nails are cut, your hair is combed and you look smart and healthy. Take your breakfast and after saying good-morning to your parents, leave your house sometime earlier to reach the school on time. How to prepare a cup of tea? Preparation of tea is an art can be acquired only with practice. The process is however, simple. Fill three quarters of the kettle with water. Place it on a stove. Let the water boil. Put some tea leaves in a clean vessel and pour boiling water over it. Put a spoon of sugar and stir it. The colour of the water will turn dark brown. Put the hot tea water into cups. Add sugar and milk to your taste. Stir it with a spoon. Tea is ready. It should be served when it is ready. How to polish a pair of shoes? For policing a pair of shoes you need a brush, a tin of boot polish of the colour of the shoes and a piece of soft cloth. First unlash the shoes and remove the dust lying on them by a brush. Then apply the polish to the shoes evenly with the brush. Rub the shoe hard so that the polish evenly spread on them. When this is done, then take the shoe one by one and brush hard to give leather lustre. Then finish it with the soft rub with a piece of cloth. Lace up the shoes and they are ready for use. Of all the animals the elephant is the largest and the strongest. It is strange looking animal with its thick legs, huge sides and back, small beady eyes and its long nose called the trunk. The trunk serves the Elephant as long arm and hand. It has asset of two false teeth called tusks which are very valuable. Elephants are pure vegetarian. They are trained for hunting. In olden days, they were used in battles. Rajas and Nawabs used to keep them for ceremonial purposes. They can carry very heavy loads and are used to draw heavy wagons. The elephant is an intelligent, but a revengeful animal. The donkey is a common ugly animal four-footed animal. It has short legs and long ears. It is used as a beast of burden. It is said that, it is a very stupid animals and never works unless it is beaten with a stick. It carries loads but stills receive the abuses of its master. The donkey is a pure vegetarian. Its hide is used in the preparation of drums. The word donkey has come to be synonyms with the dull-witted animals with a thick hide. Call a person a donkey and he knows what you mean. I love the rose the most and who does not? It is the queen of all flowers. It surpasses all other flowers in fragrance and beauty. It is usually red, but it is to be found in many familiar colours like pink, white, yellow, violet and black. It is used for making garlands and bouquets. Mixed with sugar, it is also used as light purgative. Its petal is used in medicines. Our first Prime Minister, Pt. Jawahar Lal Nehru had a great fondness for the red rose and used to keep it in his button hole. Queen Nur Jahan, who discovered its essence, also loved it. Its presence adds beauty to a lady’s curly hair. It enhances the godliness of devotee’s prayers. I am found of studying lessons that teaches us something precious about life and enables us to form good and sound character. There are many such lessons are there in my text book ‘Stories for you and Me’. Out of all these, I like the lesson on Sh. Ram Chandra Ji the best. This lesson has inspired in me the habits of obedience to elders and respect for them. It tells us that the wife/life-partner should be true and faithful to her husband and latter should love her with his whole heart and should do his best to make her life comfortable. A ruler should be true servant of his subjects. It teaches us how to face difficult situations; we should not loose heart, when we are in difficulty. The greater thing is it ingrains in us is that a word once given should be kept at all costs. Of all the indoor games, I like kite flying the most. It is very popular game among the boys in India and elsewhere. Even grown-ups indulge in kite flying. Kite flying is an art and it requires great practice. Children however, learn it quickly. It is treat to see a kite going up in the air. Very often kite-flying contest are held, glass-powder coated thread is used to intercept other kites and cut them. When one kite is out off, loud shouts of ‘Bo Katta’ are raised on all sides. The boys run hard to catch the falling kite. Sometimes, they quarrel over it. This indoor-game gives exercise to the limbs and sharpens eye-sight. But it has its dangers as well. Some boys falls of the roof and are seriously injured. Kites should, therefore, be flown out on the roofs with railings or in the open ground. An aeroplane is a flying ship. It is of a very big size although it appears to be no bigger than kite when it is high up in the air. It has two sometimes four big wings and a tail. It has a small wheel under it. Inside the plane there are seats for the passengers to sit. There is also an engine, which is worked by patrol. An ordinary plane can fly from 300 kilometres to 800 kilometres per hours. Aeroplanes carry passengers, goods and mails. During famine, they carry food. When rivers in spate overflow their banks and cause a great havoc, food and medicine are dropped for the person in water-plunged areas. But the aeroplane can also be used for destructive purposes. In the war with Pakistan, they were used to destroy the enemy troops and their ammunition by dropping bombs on them. Spring is the queen of all seasons. In spring the nature is at its best. Tree put forth new leaves. Green grass covers the ground and the cattle enjoy hearty meals. Fruit trees are in blossom. The garden hedges wear flowers. The air is laden with fragrance. This is the time when the birds sing and dart about filling the air with their sweet notes. They gay butterfly flits about. The bee flies from flower to flower to store up honey, kids lambs and deer frisk about merrily. Peacocks dance in their merriment. The cold wind gives place to light breeze. It is the time for merry-making. People go out for picnic and outing. In fact, in spring, there is life, joy and freshness everywhere. I daily go out for morning walk. Yesterday morning when I went out, the sky was deep blue. There was not a speck of cloud in the sky. Hardly had I gone about a kilometre towards Ramnagar, when on looking up, I was surprised to find that the whole sky overcast with thick, dark clouds. It soon began to drizzle. I at once changed my course and hastened back. The drizzles changed into a surging, stinging rain. I ran hard but in vain. I looked for shelter. There was hut nearby. I made for it. I took my place in the corner, but soon the hut began to leak. I was drenched. After half an hour the rain stopped. The sky was clear. I returned home, wet to the skin. The proverb means that when a man really wants to do something, he finds ways and means of doing it. The thirsty crow, suffering from acute thirst, raised the level of water in the pitcher by dropping pebbles into it. The man, in order to make his life easy and comfortable, has invented some very useful things. It is the necessity that has acted an incentive to make the man to invent and discovered all those things that we found around us. The world would have remained stand-still if the man had not been forced by the necessity to go ahead. Verily, ‘Necessity is the mother of invention’. Man is superior to all living creature, because he can think, gain knowledge and make use of it. Knowledge is indeed a great power. 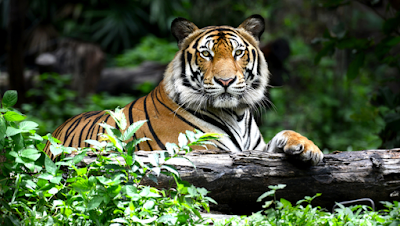 Because of knowledge the humans can tame the wildest of beasts like lion and strongest of animal like elephant. We have conquered air and water. One can fly in air and sail on water. We have wrested from the nature many of her secrets. We can talk and see our friends and relatives who may be thousands kilometres away. It is due to the power of knowledge that we as human possesses. Nobody can gainsay the fact that knowledge is power; but when it is not rightly used, it does much harm. The saying, ‘Handsome is that Handsome does’, means that gentle and generous behaviour of a person earns greater respect in the world than his good looks or physical beauty. The common beliefs are that a man with a fair complexion is handsome but this is wrong. Physical beauty is transitory. An accident may occur and a good looking person may become an ugly. A man, who does handsome deeds is, in fact, handsome. Many great men who are stills remembered were not good-looking, they are respected for the great and noble deeds they did. Subhash Chandra Bose is one of them, Mahatma Gandhi, Abraham Lincoln and many such great leaders. Greatness lies only in noble and handsome deeds, done for the good for others. An honest man has a clear conscience. When faced with trials, he stands firm and string like a rock. He cannot be shaken from his resolve and position. He would rather die than act dishonestly. He cannot be bought with gold. He always wins the trust and respects of others. History records instances of several men who rose to power simply because they were honest. The prophet of Islam’s honesty is proverbial. Abraham Lincoln’s honest made him the President of America. A dishonest person can never have a contented mind, he may flourish for a time, but will miserably fail in the long run. So, ‘Honest is the best policy’, as says the proverb. It is common experience that still water run deep and shallow current makes a good deal of noise. A man with a little knowledge is apt to think that he knows a lot. This makes him proud and stands in the way of his acquiring further knowledge. Knowledge is like a vast ocean. One should not be proud of knowledge he or she possesses. Only empty vessels make a noise. A man having little knowledge cannot distinguish between right and wrong. The life of patient in the hand of doctor with insufficient knowledge is always in danger. A teacher who has a little grasp of his subject most often misguides the pupils. A commander who knows little about the art of war brings about the downfall of his country. In short, little knowledge is dangerous in all walks of life. The saying, ‘Face is the index of mind’, means that quite often inner state of mind of a person peeps through his visage. The feeling of love and hatred, of crookedness and straight dealing, softness and fear are all strong enough to change a human look and behaviour. Eyes play a great part in finding a person. From the hue of the eyes one can assess if a person is in love, indifferent or barbaric. Our thoughts and emotions are reflected on our face. In case of fear and pain, the face grows distorted and pale. When angry the face grows red. A sad man pulls a long face and happy man’s face is always bright and gay. There may be a person, here and there, clever enough to hide his feelings and wear an impenetrable mask, but, in general we can judge a person from his face. Things are not always what they seem to be. We should not go simply appearances; appearances are often deceptive. Manu rogues and crooks can easily pass fot gentlemen. It is only when we come to deal with them that we find, to our disappointment, that they are not what they appear to be. A smiling face does not always indicate good nature. Some selfish people profess to be our best friends, but prove themselves wolves in lambs, clothing. ‘All that glitters is not gold’ is a common proverb. It is the touch-stone that gives the glittering object the lie. Must test a person before you make friends with him? It is wrong to believe that God’s blessing can be obtained by mere prayers. He rewards those who act and not those who leave everything to him. He will not deny us the fruit of our labour. Believe I God should serve us an incentive to work. History shows that only those men were able to rise in life that had courage and spirit of endeavour. They fought against difficulties and removed their hurdles with a strong will power. Those who idle away their precious time, find their start always against them. The curse God instead of cursing themselves. God is always with the industrious. Success kisses the feet of those who put shoulders to the wheel. God will surely help us if we set about a task with firm will and carry it on with patient and perseverance. Might is right is a well-known proverbs which illustrate the truth that a strong person can always have his own ways. He is not bothered with what he does is agreeable or dis-agreeable to those whom the matter may concern. The history of mankind is the story of strong against weak. All religious teachings are set aside; all canons of justice and fair play are flouted when the mighty rules the weak. It is just like the law of the jungle where force and violence have their way. The story of ‘The wolf and the lamb’ best illustrate the human nature. He did not care for the genuine pleas of the lamb. He found one excuse or the other to eat it up. Even in our civilized society today, where rule of the law governs our lives, we find the law being distorted by the wealthy and the strong to their favour while the poor and the week suffer. Well begun is half done? The instructive maxim tells in a beautiful way that it needs more courage and initiative to start a work than to complete the rest of it. It’s a common human nature to postpone and put off things. When a work is begun, the initiative for its completion grows in the doer. By leaving it half way, he will have to forego the labour spent in the beginning. Wise parents often help their children in the start to cultivate their interest in the work and then leave to the task. The proverbs also imply that a good foundation ensures the strength of a thing. A child when young can be moulded to good habits and character just as a well planted tree can promise good fruit. The success of the projects can be foretold from the nature of its start. Whoever said it must have realised the truth of it. A thing of beauty is a source of everlasting joy. Everything we come across in this world is transient, but beauty in whatever form it is found inspires in man a feeling, a sense of joy which last with his life. It keeps haunting him and sweetening the darkest days of his life. It is an inexhaustible treasure of joy. It is a perennials source of pleasure and agreeable thoughts. A flower fades away soon after it blossoms, but the impression that it creates on a sensitive mind gets imprinted on it and can never be erased. Its joy does not perish; it is not transitory, just as the thing itself is. It is advisable for all who wants to accomplish and make name for them-selves to seize an opportunity as soon as, it is in its presents form and the make the best use of it. Those who let up opportunity slip away unused, afterwards wring their hands in despair. A blacksmith beats the iron when it is hot. He does not let it cool. If he were to allow it to cool, he would not be able to turn it into the desirable shape and form. Just as lost time can never be regained, an opportunity once lost is lost forever. So strike the iron when it is hot, if you want to succeed in life.